The legacy of Roman invasion apparent in some of our roads and walls never made it to footpaths and bridleways. And thank diddley for that. Our beautiful countryside wouldn’t be so captivating if our wanderings were only ever in a straight line. For a nation that is increasingly sedentary, it’s a good job our public footpaths and rambling routes keep us guessing. Our crazy lifestyles are leading us to become a nation that’s reserving walking for our holidays. So if that’s the case, we’d better give you some options to try out when you’re next on your jollies. One promise: they’re not very straight. We delve into Lancashire’s dark past on this walk. The so-called Pendle Witches were 10 people executed for witchcraft on Lancashire’s moors over 400 years ago. Starting in Barley Car Park you can take a western or eastern loop, or meander the whole figure of eight totalling about 7.5 miles. You’ll take in churches, a quarry and the farms of some of those who gave evidence against the accused. Most significantly, you’ll reach the summit of Pendle Hill. Insignificant in the amount of puff this gentle climb will require. But the hill has many a story to tell. Discovered to be a Bronze Age burial site, it also inspired George Fox to found the Quaker movement after a visionary moment caused by the exertion. Jump off the train at Knaresborough and you could be forgiven for thinking you’re in Hovis country. Well, you’re not that far away. This is a beautiful old town so take your time over this 3 mile walk because you’ll want to look up and all around as you go. Making your way along Abbey Road a glance up will catch a glimpse of the Chapel of Our Lady of The Crag a rather unique chapel built into the rock face dating back to the early 1400s. A wander into the riverside woodlands and you’ll be greeted by spectacular wood carvings. This trail is a real treat. Derbyshire’s rural pseudonym is the Peak District. Perhaps most well known for its rural towns and villages such as Buxton and its Dovedale walks. Many a local school kid has been on an outdoor education adventure to the latter. What is lesser known about the Peak District, unless you’re an avid rambler, is its two distinct foundations: White Peak is of limestone foundation and Dark Peak consists of gritstone. 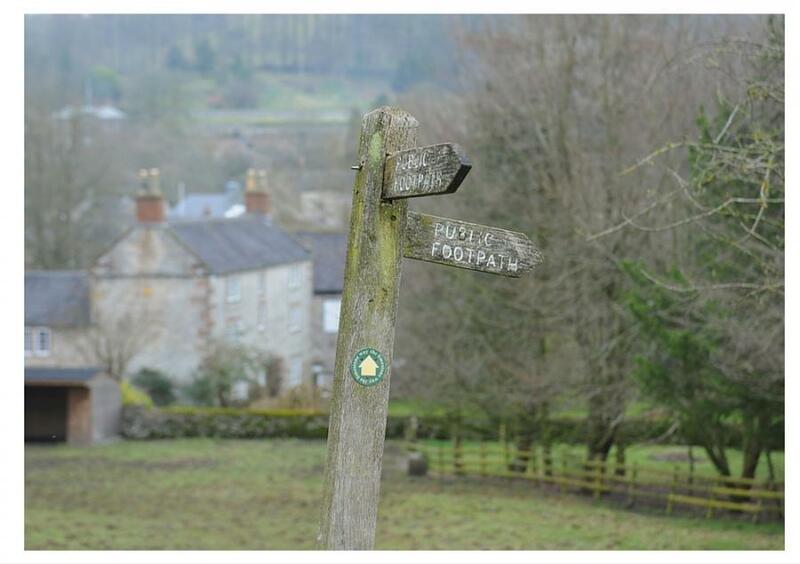 There’s a decent 6 mile circular walk from Wetton Ford north east of Ashbourne. It’ll take you along Manifold Valley following the River Manifold to Wetton Mill. You’ll work your hamstrings climbing up Ecton Hill and again on the final woodland descent back to Wetton Ford. And you’ll be grateful for the views from atop the hill – they’re the perfect excuse for a rest. On the latter part of the walk take some time to explore Thor’s Cave and let your imagination wander to its inhabited days some 10,000 years ago. It would too easy to include a walk up or around Mount Snowdon. And we bet some of you would cheat and take the mountain train anyway! So we’ve opted for a ramble that climbs Wales’ second highest mountain, Cadair Idris. I last did this climb when I was still in primary school, so don’t you go running from this one at the prospect of climbing a mountain, it’s very achievable in around half a day. Obviously there are there-and-back walks, but we’ve chosen a route that takes you up the north face along the Pony Path, over the top (Penygadair) taking in the beautiful spectacle of Cadair’s three lakes and down the south face via the Minffordd Path. The route starts at Ty-nant and there are steep sections on the ascent and the descent. But on a clear day the views are simply breathtaking. And you’ll get a real sense of Snowdonia’s stunning undulations too. It would be remiss of me to skip over the opportunity to name check my village namesake when writing about walks in Gloucestershire. But the fact that the Cotswold Hills stretch this far west is often overlooked. The walk starts in Dursley, a village that recent legend has it was deemed less than inspiring by JK Rowling and hence used as the surname for Harry Potter’s begrudging guardians, the Dursleys. Well, we’ll beg to differ on account of it being the start and end point for this walk around Stinchcombe Hill and neighbouring North Nibley. All up, this meandering wander is about 7 miles. Even if you only do the first part of the walk, a loop around Stinchcombe, the views are quite something. And although these are climbs of relatively insignificant proportions, you’ll come away with a fresh respect for the golfers who spend their days on the fairways of Stinchcombe Hill Golf Club. If you take the North Nibley route, spare some energy for the climb up to Tyndale Monument. And for the fittest in your pack, the monument’s tower can be climbed too! Brean Down. Known as Somerset’s natural pier for its projection into the sea. There’s a refreshing 3 mile circular walk to the end of the pier and back that includes the site of a Roman temple. Brent Knoll. An Iron Age hill fort from which summit successors will be rewarded with views across the county and beyond. Start your 1.5 mile walk from Brent Knoll Church. Burrow Mump. Home to a fascinating history and a very relevant modern memorial. This is a very short walk from the National Trust car park to the church ruins that remain at the top of the hill and it is now a Somerset memorial to those from the county who lost their lives in World War I and World War II. Crook Peak. The 2.5 mile climb to its conical summit and around offers a view across the Mendip Hills as far as Wales (via the M5). Just keep looking where you’re going. Lollover Hill. Meaning ‘look over’ and so named for its vantage point from which locals are said to have watched the Battle of Sedgemoor in 1685. Nowadays, follow the footpath from Compton Dundon Church and once you reach the hilltop you can see Glastonbury Tor and the Admiral Hood Monument atop Windmill Hill. One of our favourite Devon walks is less of a walking trail and more of a healthy way to take in Salcombe, its surrounding bays and its almost hidden National Trust property, Overbecks. The 1.9 mile walk from one to the other will feel longer because there are some generous hills between each of the bays. From Fore Street in central Salcombe walk up the hill and take in the estuary view as you pass the Yacht Club and the War Memorial. You’ll weave downhill into North Sands past your lunch option, the Winking Prawn, then begin your ascent on the two or more hills that’ll take you to South Sands. Climb your way out of the bay past the driveway to the Bolt Head Hotel and you’ll arrive at the familiar National Trust shed entrance. You can continue your walk around the cliff for some spectacular views. Or weave your way up a little further to Overbecks with its beautiful cliff edge gardens and thoughtfully maintained house and tea room. Obviously we’d encourage you to walk all the way back, especially for that lunch. But if the sun is blazing, take the sea tractor from South Sands directly into Salcombe harbour. If you can drag yourself away from the Newquay surf, you’ll see pretty much the whole town and all its beauty spots on a 6 mile circular walk that largely follows the South West Coast Path and can be shortened at any point for those craving the breakwaters or a coffee. Theoretically, you could start anywhere on a circular route but for ease start on Cliff Road and follow the old tramway along Tram Track and you’ll find yourself on the coastal path. Take in Towan Beach from the footpath above and look across the to the harbour (the ‘new quay’) – that’s where you’re heading next. From the harbour head up the steps toward Huer’s Hut. The huer being the person once responsible for alerting local fisherman to lingering shoals of pilchards. Oh yes, pilchards. Newquay wasn’t always about cool surf dudes and sea salt spray bed heads. You can divert off the coastal path to see the old life boat building and enjoy the views from the headland. Otherwise keep following the path towards the acclaimed surfers’ paradise of Fistral Beach. From Fistral the next headland offers views across to Crantock Beach over the River Gannel. Follow the estuary inland and turn left back into town when you reach Trenance Lane. There you go; you saw Newquay and got to see some surf too. For a short, family friendly walk, the National Trust heritage trail around Great Yarmouth will get everyone moving, is buggy friendly and leave you a fact or two wiser about this historic coastal town. Starting at the Elizabethan House Museum on the quayside make your way towards Greyfriar’s Cloisters and the Town Hall. The cloisters are what remains of a 13th century Franciscan Friary. From there head for Norfolk’s Nelson Museum. If you stop here – there’s a picnic area – you might have to drag any Nelson enthusiasts away. Turning left along Nottingham Way you’ll pass merchant’s houses before heading right down Blackfriar’s Road towards the Time and Tide Museum, which is situated in a former herring curing building. From St Nicholas’ Church cross the road to visit the Smokehouse. There are museums galore here and this is a neat way to cover them all and not wear out the kids too much. Now if you think East Anglia is as flat as a pancake this short Norfolk walk up and around Burgh Castle will raise the roof on your vista and pack a decent historic punch too. Burgh Castle dates back as far as the 3rd century with its Roman origins as a fort and was then built as a Saxon defense protecting the area from Saxon raiders. Only three of its four walls remain and as you cast your eyes across the Waveney and Yare rivers you’ll understand where the fourth wall crumbled to. This is an easy walk with the kids and mostly buggy friendly too. But for those looking to stretch their legs a little further, at Burgh Castle you’re already on the Angles Way path that’ll have you in Great Yarmouth if you keep going. If you’re heading east on a walking holiday you won’t be spoilt for choice: Weavers’ Way at 56 miles long stretches from Great Yarmouth to Cromer and Wherryman’s Way from Great Yarmouth to Norwich meanders for 35 miles. You don’t have to take a walking holiday to enjoy a bumpy towpath, windy ridge or dilapidated stile. And you don’t need more than a comfy pair of trainers to get out there, unless you’re tackling the whole coastal path. But if you’re holidaying in the UK this year, find a path, pack some water and enjoy the walk.